to the escape hatch! 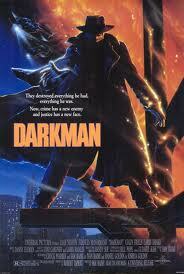 : Obsessive Cinematic Disorder: Why Wasn’t Bruce Campbell in the Darkman Sequels? Obsessive Cinematic Disorder: Why Wasn’t Bruce Campbell in the Darkman Sequels? In this installment of OCD, allow me to geek out (more than normal) – what’s the deal with the Darkman sequels? If you haven’t seen any of the Darkman films, the plot of the original is this – scientist Peyton Westlake (played by Liam Neeson) is beaten up, blown up, and left for dead by the goons of local mobster Robert Durant. Westlake, thanks to the emergency surgery that saved his life, rises from the proverbial ashes stronger than ever. 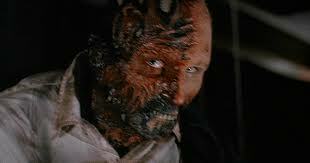 He was badly burned in the explosion, but Westlake uses a synthetic skin formula he was working on before his attack to hide his disfigurement and disguise his identity during his quest for revenge. My question is this: Why wasn’t Bruce “Ash” Campbell, longtime friend of and collaborator with The Evil Dead and Darkman director Sam Raimi in the two Darkman sequels? Bruce makes a cameo at the end of the original film as “final shemp” or the last disguise that Westlake takes before the credits roll. Thanks to Wikipedia, I know why Bruce only played Darkman for a few minutes in the original, as opposed to during the whole film as Raimi originally intended – the studio didn’t think that he could “carry the role.” But what’s with the Neeson-free sequels? Bruce would have been a great Darkman – and the ending of the original literally sets him up for the role in further adventures. I would think that this was intentional on the part of Sam Raimi and Bruce himself – that way he could just continue the roll in the sequels. But instead we get Arnold “Imhotep” Vosloo as Darkman in both sequels (full disclosure – I haven’t seen much of them), Darkman II: The Return of Durant (spoiler alert) and Darkman III: Die, Darkman, Die. I don’t mean to disparage Liam Neeson – he was a fine Darkman. Vosloo – meh. 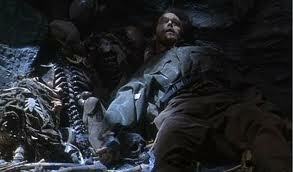 I can’t really say, since I’ve really only seen him in The Mummy films. It’s just that I like Bruce Campbell (Is there a name for Campbell fans? Bruce Buffs?) and definitely would be more interested in the sequels if he was in them. It may have just been scheduling conflicts – the first sequel was released in July of 1995, so I guess Bruce was busy with other projects like The Hudsucker Proxy and The Adventures of Brisco County Jr. And he was busy with various films and TV shows in ’95 and ’96, which could have excluded him from Darkman III, released in August of ’96. '95 gave us Congo. Didn't turn out so good for Bruce. I don’t know, though. I feel like Bruce would have made the time for these films. They went direct-to-video, but I could still see him signing on, if he had been asked that is. I’ll have to just go with the scheduling conflict theory, since the idea that no one considered recasting Bruce as Westlake is silly. Great article. Was wondering this same goddamn thing today. Dirty Mummy ruined this series. Could not stay in til the end. Was there some twist on how Dr. Giggles survived the horrendous helicopter crash? Don't recall Darkman having an accent either...Such a waste.